These highlights do not include all the information needed to use NAMENDA XR capsules safely and effectively. See full prescribing information for NAMENDA XR capsules. To report SUSPECTED ADVERSE REACTIONS, contact Allergan at 1-800-433-8871 or FDA at 1-800-FDA-1088 or www.fda.gov/medwatch. 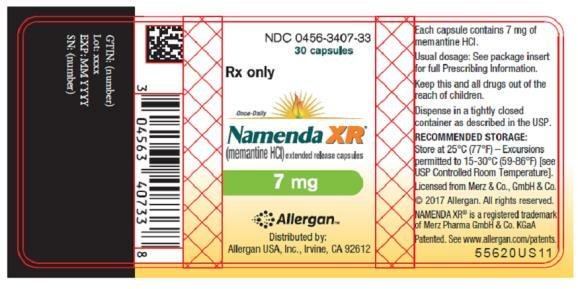 NAMENDA XR (memantine hydrochloride) extended-release capsules are indicated for the treatment of moderate to severe dementia of the Alzheimer’s type. In patients with severe renal impairment (creatinine clearance of 5 – 29 mL/min, based on the Cockcroft-Gault equation), the recommended maintenance dose (and maximum recommended dose) is 14 mg/day [see Clinical Pharmacology (12.3)]. NAMENDA XR was evaluated in a double-blind placebo-controlled trial in which a total of 676 patients with moderate to severe dementia of the Alzheimer’s type (341 patients on NAMENDA XR 28 mg/day and 335 patients on placebo) were treated for up to 24 weeks. Memantine given orally to pregnant rats and pregnant rabbits during the period of organogenesis was not teratogenic up to the highest doses tested (18 mg/kg/day in rats and 30 mg/kg/day in rabbits, which are 6 and 21 times, respectively, the maximum recommended human dose [MRHD] on a mg/m2 basis). Slight maternal toxicity, decreased pup weights and an increased incidence of non-ossified cervical vertebrae were seen at an oral dose of 18 mg/kg/day in a study in which rats were given oral memantine beginning pre-mating and continuing through the postpartum period. Slight maternal toxicity and decreased pup weights were also seen at this dose in a study in which rats were treated from day 15 of gestation through the post-partum period. The no-effect dose for these effects was 6 mg/kg, which is 2 times the MRHD on a mg/m2 basis. Memantine failed to demonstrate efficacy in two 12-week controlled clinical studies of 578 pediatric patients aged 6-12 years with autism spectrum disorders (ASD), including autism Asperger’s disorder and Pervasive Development Disorder - Not Otherwise Specified (PDD-NOS). Memantine has not been studied in pediatric patients under 6 years of age or over 12 years of age. 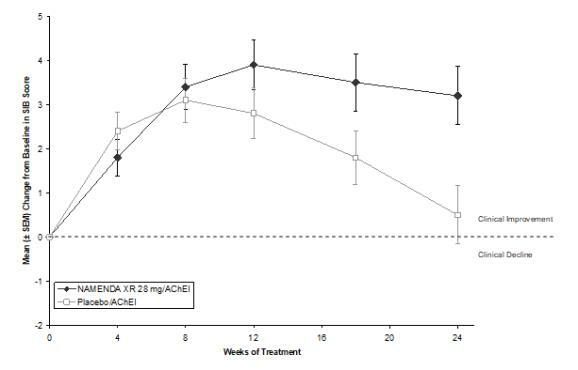 Memantine treatment was initiated at 3 mg/day and the dose was escalated to the target dose (weight-based) by week 6. Oral doses of memantine 3, 6, 9, or 15 mg extended-release capsules were administered once daily to patients with weights < 20 kg, 20-39 kg, 40-59 kg and ≥ 60 kg, respectively. The overall safety profile of memantine in pediatric patients was generally consistent with the known safety profile in adults [see Adverse Reactions (6.1)]. In a juvenile animal study, male and female juvenile rats were administered memantine (15, 30, and 45 mg/kg/day) starting on postnatal day (PND) 14 through PND 70. Body weights were reduced at 45 mg/kg/day. Delays in sexual maturation were noted in male and female rats at doses ≥ 30 mg/kg/day. Memantine induced neuronal lesions in several areas of the brain on PND 15 and 17 at doses ≥ 30 mg/kg/day. Behavioral toxicity (decrease percent of auditory startle habituation) was noted for animals in the 45 mg/kg/day dose group. The 15 mg/kg/day dose was considered the No-Observed-Adverse-Effect-Level (NOAEL) for this study. The majority of people with Alzheimer’s disease are 65 years and older. In the clinical study of memantine HCl extended-release, the mean age of patients was approximately 77; over 91% of patients were 65 years and older, 67% were 75 years and older, and 14% were at or above 85 years of age. The efficacy and safety data presented in the clinical trials section were obtained from these patients. There were no clinically meaningful differences in most adverse reactions reported by patient groups ≥ 65 years old and < 65 year old. No dosage adjustment is needed in patients with mild or moderate renal impairment. A dosage reduction is recommended in patients with severe renal impairment [see Dosage and Administration (2.3) and Clinical Pharmacology (12.3)]. No dosage adjustment is needed in patients with mild or moderate hepatic impairment. Namenda XR was not studied in patients with severe hepatic impairment [see Clinical Pharmacology (12.3)]. 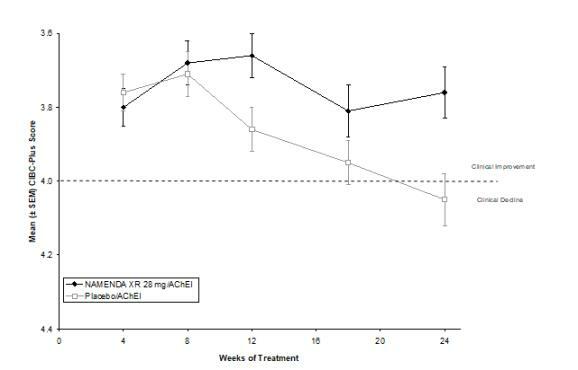 One patient participating in a NAMENDA XR clinical trial unintentionally took 112 mg of NAMENDA XR daily for 31 days and experienced an elevated serum uric acid, elevated serum alkaline phosphatase, and low platelet count. Fatal outcome has been very rarely been reported with memantine, and the relationship to memantine was unclear. HCl occurs as a fine white to off-white powder and is soluble in water. Memantine is excreted predominantly in the urine, unchanged, and has a terminal elimination half-life of about 60-80 hours. About 48% of administered drug is excreted unchanged in urine; the remainder is converted primarily to three polar metabolites which possess minimal NMDA receptor antagonistic activity: the N-glucuronide conjugate, 6-hydroxy memantine, and 1-nitroso-deaminated memantine. A total of 74% of the administered dose is excreted as the sum of the parent drug and the N-glucuronide conjugate. Renal clearance involves active tubular secretion moderated by pH dependent tubular reabsorption. Memantine pharmacokinetics were evaluated following the administration of single oral doses of 20 mg in 8 subjects with moderate hepatic impairment (Child-Pugh Class B, score 7-9) and 8 subjects who were age-, gender-, and weight-matched to the hepatically-impaired subjects. There was no change in memantine exposure (based on Cmax and AUC) in subjects with moderate hepatic impairment as compared with healthy subjects. However, terminal elimination half-life increased by about 16% in subjects with moderate hepatic impairment as compared with healthy subjects. Coadministration of memantine with the AChE inhibitor donepezil HCl did not affect the pharmacokinetics of either compound. Furthermore, memantine did not affect AChE inhibition by donepezil. In a 24-week controlled clinical study in patients with moderate to severe Alzheimer’s disease, the adverse reaction profile observed with a combination of memantine immediate-release and donepezil was similar to that of donepezil alone. There was no evidence of carcinogenicity in a 113-week oral study in mice at doses up to 40 mg/kg/day (7 times the maximum recommended human dose [MRHD] on a mg/m2 basis). There was also no evidence of carcinogenicity in rats orally dosed at up to 40 mg/kg/day for 71 weeks followed by 20 mg/kg/day (14 and 7 times the MRHD on a mg/m2 basis, respectively) through 128 weeks. No impairment of fertility or reproductive performance was seen in rats administered up to 18 mg/kg/day (6 times the MRHD on a mg/m2 basis) orally from 14 days prior to mating through gestation and lactation in females, or for 60 days prior to mating in males. Memantine induced neuronal lesions (vacuolation and necrosis) in the multipolar and pyramidal cells in cortical layers III and IV of the posterior cingulate and retrosplenial neocortices in rats, similar to those which are known to occur in rodents administered other NMDA receptor antagonists. Lesions were seen after a single dose of memantine. In a study in which rats were given daily oral doses of memantine for 14 days, the no-effect dose for neuronal necrosis was 4 times the maximum recommended human dose (MRHD of 28 mg/day) on a mg/m2 basis. The effectiveness of NAMENDA XR as a treatment for patients with moderate to severe Alzheimer’s disease was based on the results of a double-blind, placebo-controlled trial. This was a randomized double-blind clinical investigation in outpatients with moderate to severe Alzheimer’s disease (diagnosed by DSM-IV criteria and NINCDS-ADRDA criteria for AD with a Mini Mental State Examination (MMSE) score ≥ 3 and ≤ 14 at Screening and Baseline) receiving acetylcholinesterase inhibitor (AChEI) therapy at a stable dose for 3 months prior to screening. The mean age of patients participating in this trial was 76.5 years with a range of 49-97 years. Approximately 72% of patients were female and 94% were Caucasian. 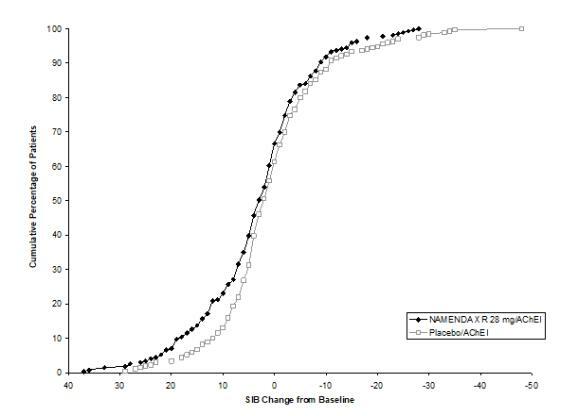 The effectiveness of NAMENDA XR was evaluated in this study using the co-primary efficacy parameters of Severe Impairment Battery (SIB) and the Clinician’s Interview-Based Impression of Change (CIBIC-Plus). 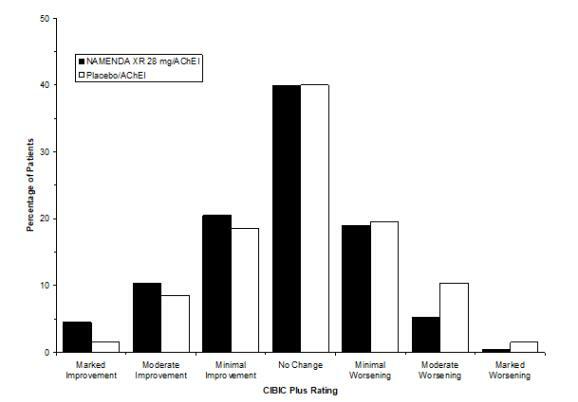 The ability of NAMENDA XR to produce an overall clinical effect was assessed using a Clinician’s Interview Based Impression of Change that required the use of caregiver information, the CIBIC-Plus. The CIBIC-Plus is not a single instrument and is not a standardized instrument like the ADCS-ADL or SIB. Clinical trials for investigational drugs have used a variety of CIBIC formats, each different in terms of depth and structure. As such, results from a CIBIC-Plus reflect clinical experience from the trial or trials in which it was used and cannot be compared directly with the results of CIBIC-Plus evaluations from other clinical trials. The CIBIC-Plus used in this trial was a structured instrument based on a comprehensive evaluation at baseline and subsequent time-points of four domains: general (overall clinical status), functional (including activities of daily living), cognitive, and behavioral. It represents the assessment of a skilled clinician using validated scales based on his/her observation during an interview with the patient, in combination with information supplied by a caregiver familiar with the behavior of the patient over the interval rated. The CIBIC-Plus is scored as a seven point categorical rating, ranging from a score of 1, indicating “marked improvement” to a score of 4, indicating “no change” to a score of 7, indicating “marked worsening.” The CIBIC-Plus has not been systematically compared directly to assessments not using information from caregivers (CIBIC) or other global methods. If a patient misses a single dose of NAMENDA XR, that patient should not double up on the next dose. The next dose should be taken as scheduled. If a patient fails to take NAMENDA XR for several days, dosing should not be resumed without consulting that patient’s healthcare professional. NAMENDA XR is a prescription medicine used for the treatment of moderate to severe dementia in people with Alzheimer’s disease. NAMENDA XR belongs to a class of medicines called NMDA (N-methyl-D-aspartate) inhibitors. If you take too much NAMENDA XR, call your doctor or poison control center at 1-800-222-1222 right away, or go to the nearest hospital emergency room. For more information about NAMENDA XR, go to www.namendaxr.com, or call Allergan at 1-800-678-1605.